Salvatore Todaro (S526) is the first in class of four U212A Todaro Class submarines. Salvatore Todaro (S526) was launched in November 2003. 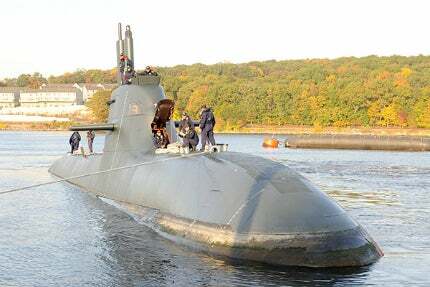 The second submarine, Scirè (S527) was commissioned in February 2007. Image courtesy of Diego Quevedo Carmona. Scire (S527) submarine arrives at Naval Submarine Base New London for a port visit. The U212A Todaro-class submarines were built by Fincantieri for the Italian Navy (Marina Militare). The first two units entered service in 2006 and 2007 respectively, while a third submarine was delivered in July 2016. The last submarine was delivered in May 2017. The Todaro-class submarine building programme is part of a joint project led by the German Submarine Consortium, which involved the development of six U212 submarines for Germany and two for Italy, including an option for two more vessels for the Italian Navy. The keel for the first Italian submarine of the U212A class, Salvatore Todaro (S526), was laid at the Muggiano shipyard in July 1999. The submarine was launched in November 2003 and commissioned into service in March 2006. The second submarine, Scirè (S527), was laid in May 2000, launched in December 2004 and delivered to the Italian Navy in February 2007. The keel for Pietro Venuti (S528) was laid in December 2009 followed by the launch in October 2014 and commissioning in 2015. The fourth and final submarine in class, Romeo Romei (S529), was launched in July 2015 and began sea trials in March 2016. The last two submarines replaced the two ageing Sauro Class III-series submarines. The Todaro-class submarines incorporate advanced technological solutions. The stealthy hull is made of anti-magnetic material, employing advanced silencing techniques to minimise acoustic signature. The submarines are equipped with a fully integrated electro-acoustic and combat control system, as well as a state-of-the-art platform automation system. The Todaro-class has a length of 56m, a diameter of 7m, a height of 12m and an average draft of 6m. The surface displacement of the submarine is 1,450t, whereas the underwater displacement is 1,830t. Each submarine is operated by 27 crew members. "The Todaro-class submarines incorporate sophisticated technological solutions. The stealthy hull is made entirely of anti-magnetic material, employing advanced silencing techniques to minimise acoustic signature." The submarine is fitted with six 533mm torpedo tubes for launching Whitehead A184 Mod.3 heavyweight torpedoes. The wire-guided torpedo with acoustic self-guidance can engage both submarines and surface vessels. The Kongsberg MSI-90U combat management system aboard the submarine is interfaced with sensors, weapons and navigation systems to detect, track and engage hostile submarines and surface vessels. The Todaro-class boats are equipped with STN Atlas Elektronik DBQS-40 sonar suite integrating a range of passive acoustic sensors such as TAS-3 low-frequency towed sonar array, FAS-3 low-medium frequency sonar and MOA 3070 mine detection sonar. The two Carl Zeiss periscopes are fitted with advanced optical and electro-optical sensors. The submarines are also equipped with a Kelvin Hughes Type 1007 navigation radar system and a WASS hydrophone device. The submarine countermeasures are supported by an FL1800U electronic warfare system, and a TAU 2000 torpedo countermeasures system with launchers for anti-torpedo decoys. The launchers can simultaneously discharge decoys to deceive the incoming anti-submarine torpedoes. The propulsion integrates a MTU diesel engine, a Piller 3.12MW generator, a Siemens 2.85MW permanent magnet electric motor, and high-performance lead acid batteries. The motor drives the seven-bladed screw-back propeller. The submarines are also fitted with air independent propulsion (AIP) system including nine Siemens SINAVY polymer electrolyte membrane (PEM) fuel cell modules with a rated power of 34kW each. The AIP fuel-cell power plant (FCPP) supplies electricity to the submarine, eliminating the need for diesel engine operation during silent slow cruising, which allows the submarine to operate underwater for extended periods. The diesel propulsion system provides a surface speed of 12k and a submerged speed of 20k.